The challenge lies with the fractal nature of the subject and the resulting high frequency of detail. If the frequency of detail is too high, then you land up with areas that alternate with high contrast between high and low exposure zones because the sampling frequency of the sensor is insufficient to capture the transition. Increasing the capture resolution does not help you here, because no matter how close you get, there’s always more information to capture, and there are limits to the resolving power of the output medium anyway – even in an Ultraprint. 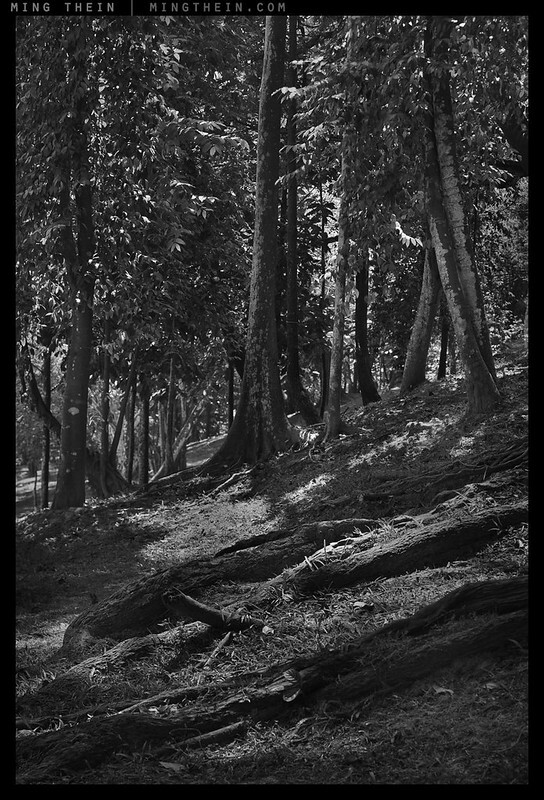 Thus what the postprocessing technique needs to do is create the perceptual illusion of tonal continuity and smoothness, which in turn contributes to placing that entire area of high frequency detail in the right exposure zone when averaged – i.e. when the image is viewed as a whole. This series was shot with a Nikon D800E, PCE 24/3.5, PCE 85/2.8 Nikkors and the Zeiss ZF.2 2/135 APO-Sonnar. Ming, I’ve been working on a similar project with trees — when the leaves have fallen in the winter, one can finally see the amazing sculptural qualities that would otherwise be hidden. Great shots of a great subject matter. While it reduces your composition options have you experimented with a polarizing filter to control high frequency detail? Does an overcast day vs full sun make a difference? Doesn’t make any difference for that. To me they look very natural. I completely agreed with your previous blog about the inbuilt ‘naturalistic’ HDR function of the eye/brain combo and I think you’ve gone a long way towards replicating this process with these images. 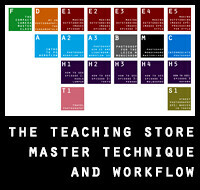 I would definitely be interested in your workflow video if it’s updated to include this. 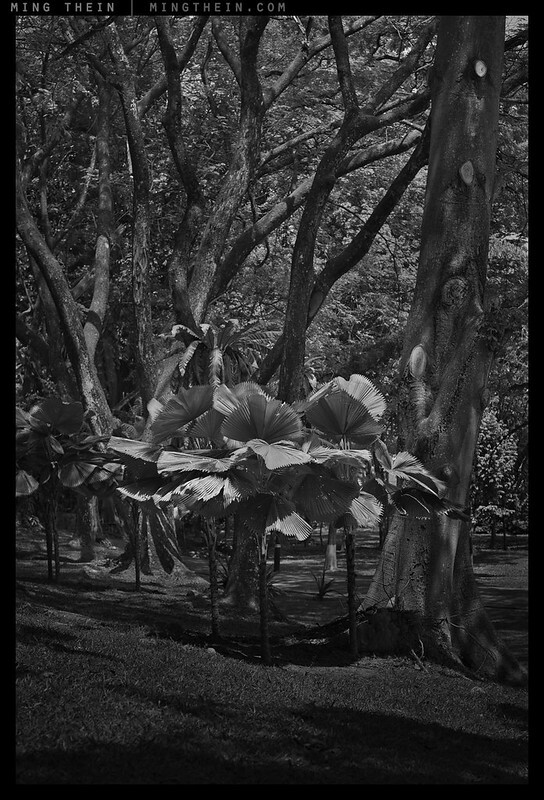 Great shots, Ming; you should write a book on b&w digital photography techniques. Framing makes, I think, a difference. 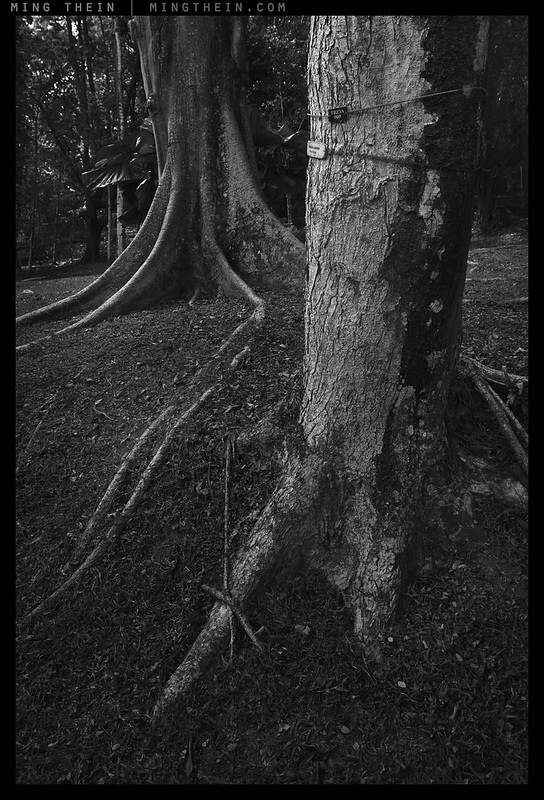 I like the tree roots in nr:s 1, 4 and 11. 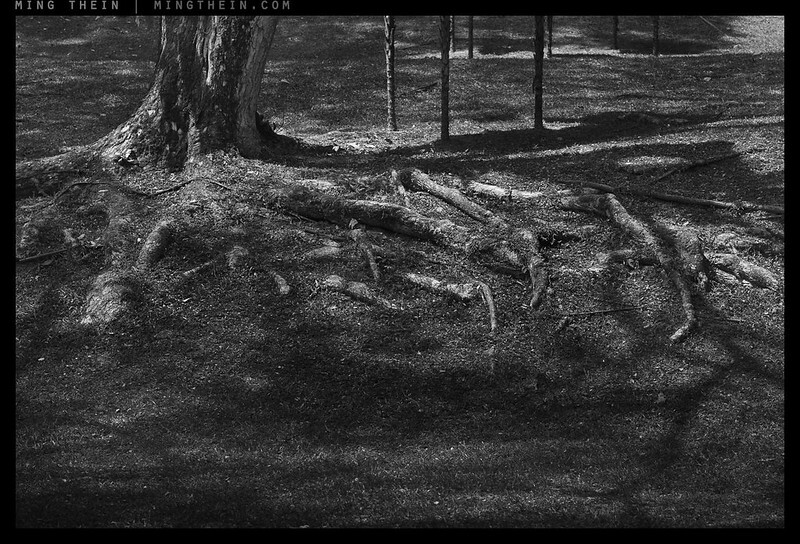 The overall appearance seems a bit dark and contrasty to me, but I suppose that is a consequence of making the tree stems and roots appear three-dimensional, considering the mixture of soft and harsh light on them? I also think nr:s 3 and 9 look quite natural, considering the harsh light. >> But when I look at all these with wide _dark_ borders around, they come alive – white borders don’t seem to work so well here! 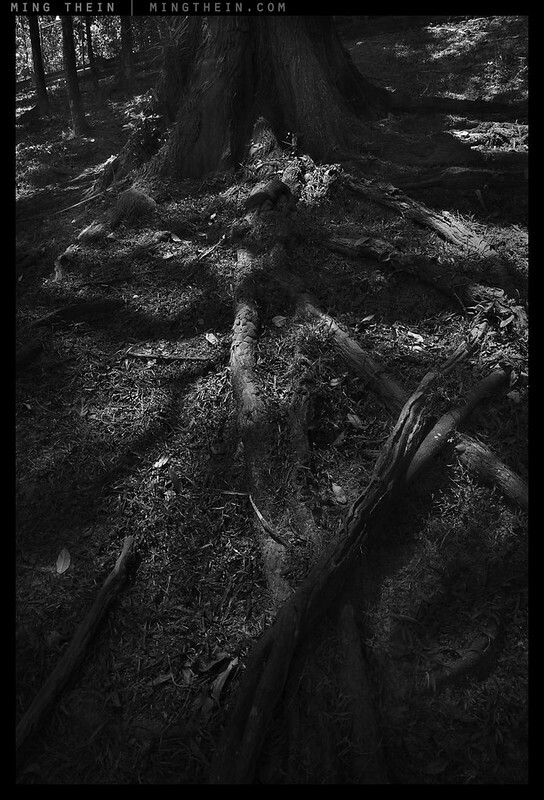 The dark foreground (nicely framing the sunlit clearing) in nr. 2 also looks more natural to me in a dark frame. With nr. 5, though, I prefer a white frame. I think nr. 10 looks more natural with a dark but more poignant with a white frame. Certainly, but I was thinking about much broader frames (like a passepartout). Some of your photos come more alive, when I replace the white background (in WordPress or Flickr) around your narrow black frame with a dark background, a dark passepartout would do the same. Pity Flickr (WordPress) doesn’t let you chose black or white as background of photos. It’s probably flickr’s out of control downsizing + sharpening algorithm – click through and view the original size. You’re always trying something new – a good sign for an artist! Some of these (in particular numbers 5-8 inclusive and the last one) strike me as definitely successful in relation to what you’ve been writing about re: black and white. They look very good. Others, not quite yet. That fits with what you wrote about it being “early days”. I can see some very interesting images coming from this approach over time. If you had the money / inclination, would you have done these with a Leica Monochrom? Seems like that would be the ideal camera to investigate the whole black and white world. 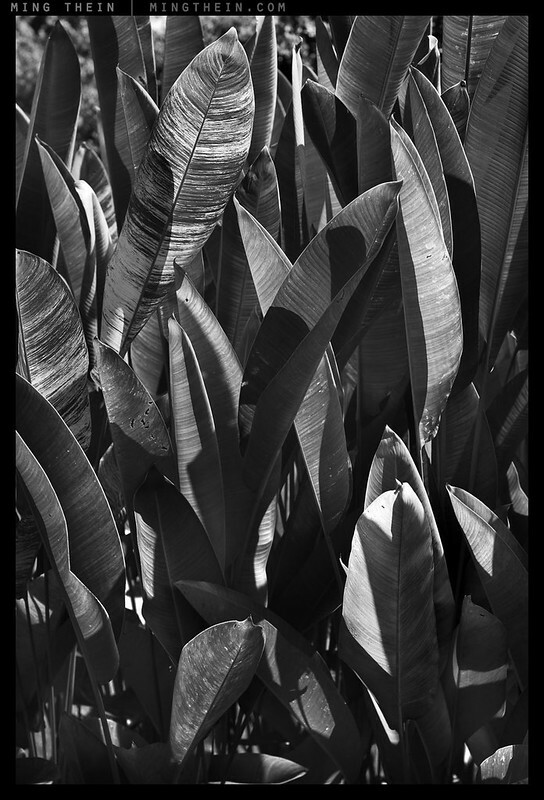 No, I wouldn’t use a Monochrom – what if I see something I want in color? I’d have to carry two cameras. 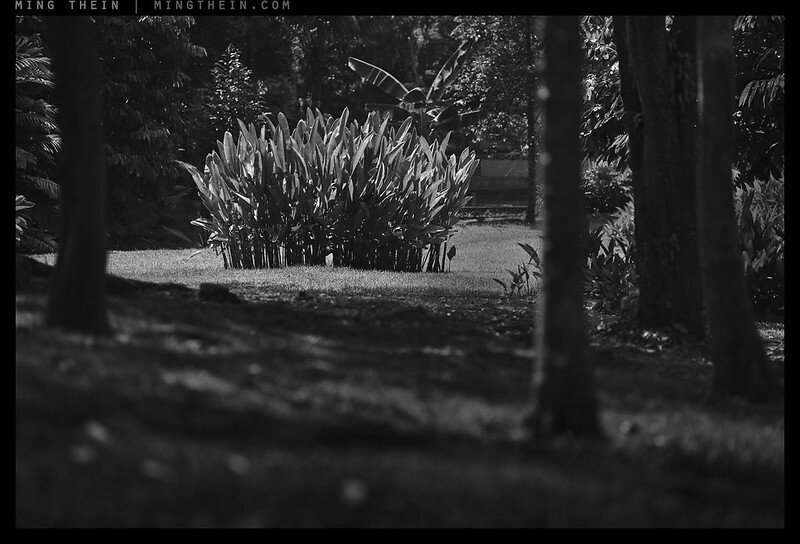 And there’s no resolution advantage over the D800E; even without the Bayer filter, resolution is about the same. Is the effect easier to handle if you choose a lens that is slightly outresolved by the sensor? 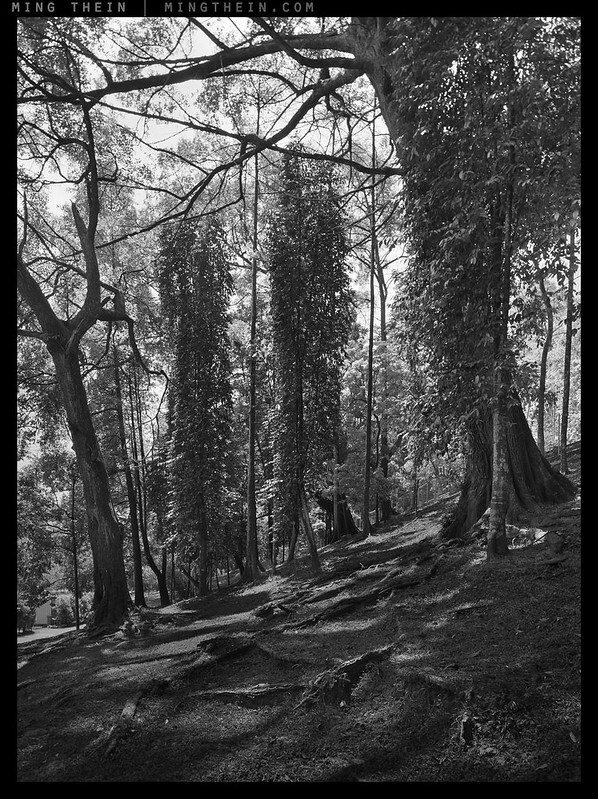 Is it easier to handle with scans of film (film limiting the dynamic range hitting the sensor)? I’ve been thinking of hexagonal sensor patterns. ( Printers and screens could be. This effect (and other “digital” effects) would still be there, but perhaps less obvious? He who waits for something good, never waits to long. A very long one indeed. Hej Ming. You are a master of tonality be it color or B/W but. ..
upper hand over the human perception of greenery. 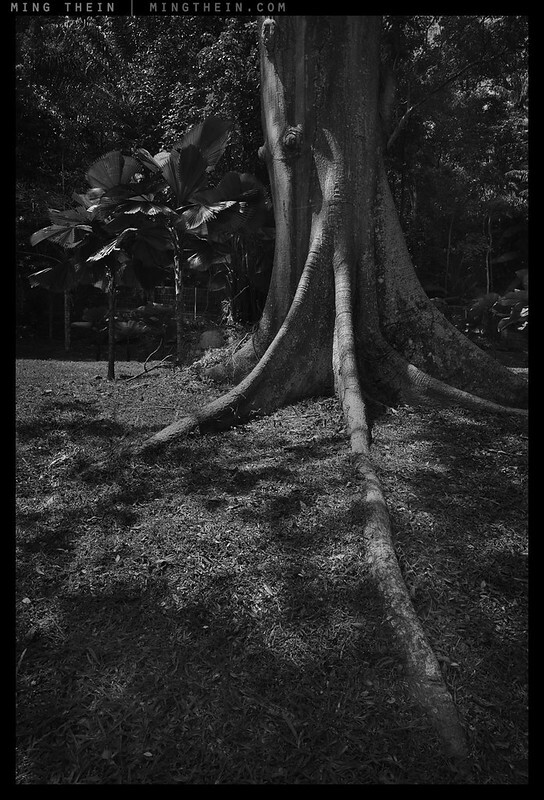 It seems that you attempt to introduce the widest B/W scale in your pictures of green. From the deepest blacks to small spots of borderwhite. While that`s valid approach for most of urbanscapes or snowy and rocky mountains, the green and brown dominated thems present much softer tonality.Just look at the color representation of same scene. Every attempt to introduce extreme dark/light scale there will look a bit unnatural. What do you think? I just looked out onto the sunlit not very dense wood behind my backyard. Wherever I look, I see small areas in the shade so dark that I can see no detail and they appear to be almost black. And everywhere where the sun is reflected off leaves and needles, these spots appear bright white. 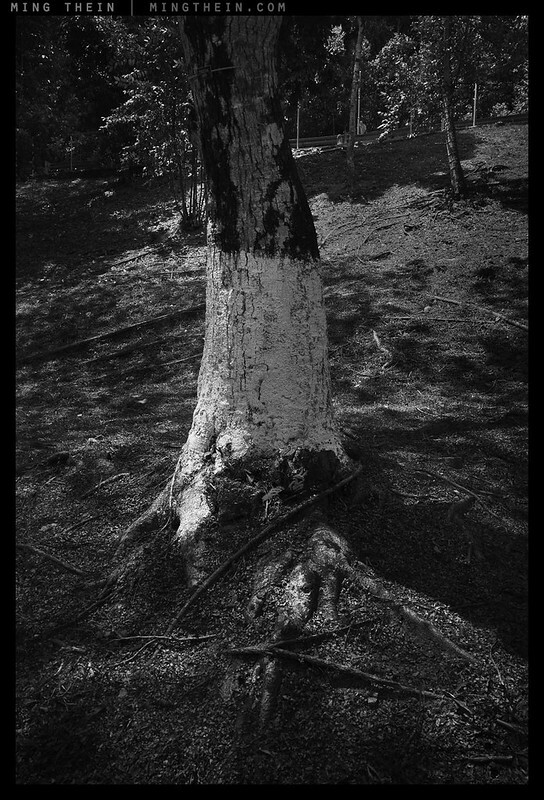 From someone who spends a large portion of time photographing trees it’s very interesting to see your approach to the subject and your final edits. It’s certainly a challenge particularly in that tropical hazy light but great results can be had as you prove here. 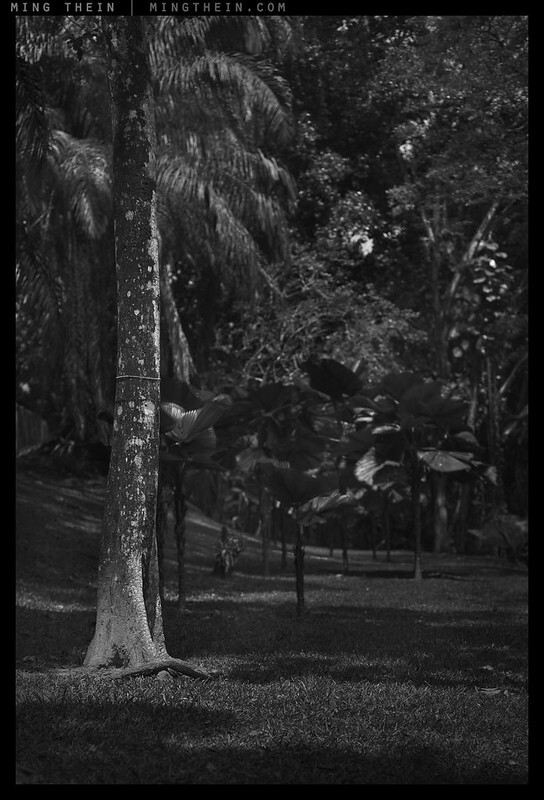 I did Singapore botanic garden a few years ago, now I must go back to the files and check out their black and white potential. I think these are great! 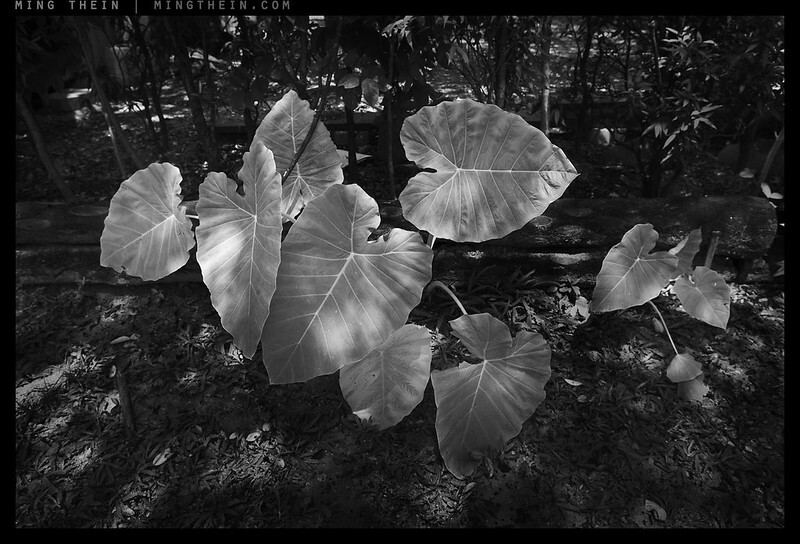 Wonderful b&w, especially the large leaves, glows from the light that falls on them! And I’m jealous of autumn! Wonderful Series od shots Ming! We have a lot of trees so always nice to have some inspiration.